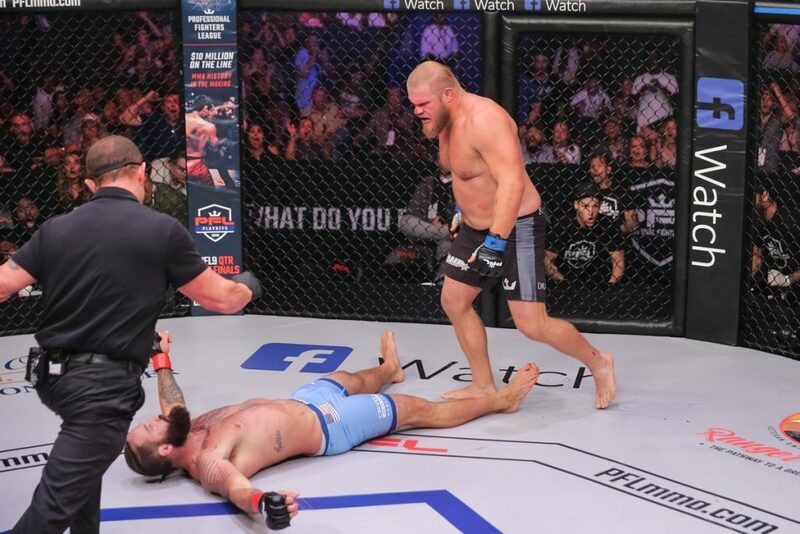 The Professional Fighters League (PFL) finished up their inaugural playoff event with a 14-bout card from Ernest N. Morial Convention Center. Finalists from both featherweight and heavyweight divisions have locked their spot for the 2018 Championship at the Hulu Theatre at Madison Square Garden on New Year’s Eve. American Lance Palmer persevered through both bouts, with the quarterfinal ending via unanimous decision over German Max Coga and finishing with another unanimous decision against the previously undefeated Andre Harrison after dominating all three rounds. Heavyweight Philipe Lins controlled his destiny with two early finishes. In the quarterfinal bout, he defeated fellow countryman Caio Alencar by submission in the first round. Lins then went on to dominate his semifinal round against Jared Rosholt, ending the fight via TKO in the second round. Top-seed Steven Siler continued his impressive run, going the distance with Nazareno Malegarie and advancing with a majority draw. He got the nod into the semis after getting the tiebreaker by winning the first round. He then advanced over Alexandre Almeida after an illegal kick led to a disqualification. In the final bout of the night, eighth seed Josh Copeland shocked the crowd after winning the quarterfinal round against Francimar Barroso via tiebreaker. He then recorded a high-light reel knockout, after a perfectly landed counterpunch to finish Alex Nicholson in the first round. The 2018 PFL Championship will be held December 31 at the Hulu Theater at Madison Square Garden and will feature six title fights, each with a PFL title and $1 million on the line. *Copeland advanced via tie-breaker by winning first round. **Siler advanced via tie-breaker by winning first round.